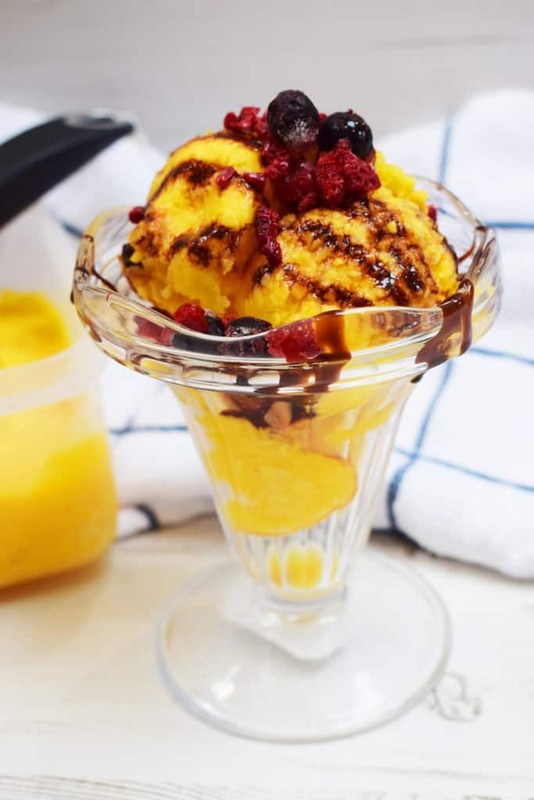 Sorbet is the ultimate Spring/Summer dessert and this Easy Peasy 20 Minute Homemade Mango Sorbet is the answer to all of your last minute pudding worries! With just three ingredients (and that includes water!) 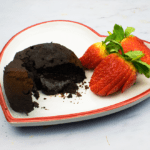 this will take max 20 minutes, giving you a delicious dessert to impress or just indulge in yourself! 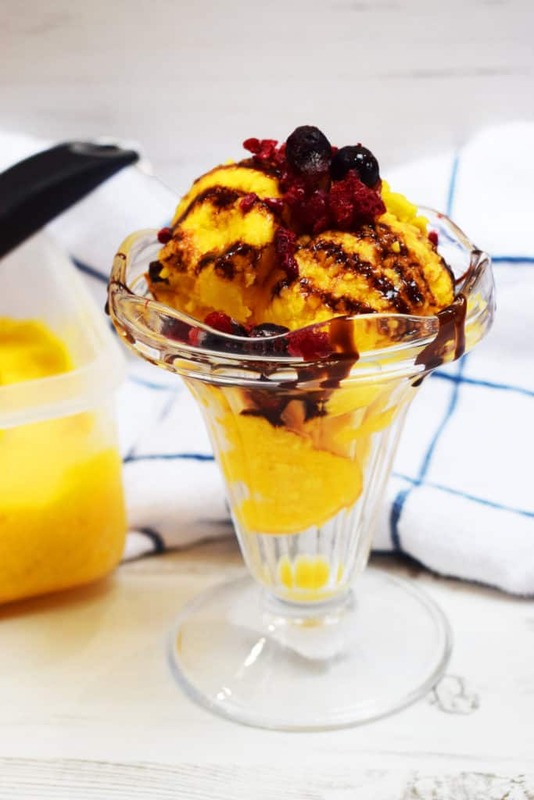 One 500g bag of mango chunks makes a big enough portion of sorbet to serve five people, and if you’re following Slimming World it works out at just 3.5 syns per portion! Not bad when you consider that Sainsbury’s Mango Sorbet works out at 6.5 syns for the same amount! So you’re halving your syns in just 20 minutes (with just 5 minutes of actual work!). 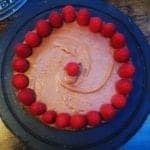 The blended mango in this recipe is synned on Slimming World, it’s annoying but that’s how the plan works so it has to be done! There are lots of people who follow the Slimming World plan who don’t syn blended fruit and that’s totally fine if it works for them. 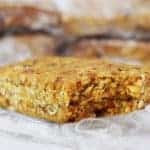 If you’re one of those people then you just need to syn the honey in this recipe (2.5 syns), but to follow the plan to the letter you need to account 3 syns per 100g of blended mango. 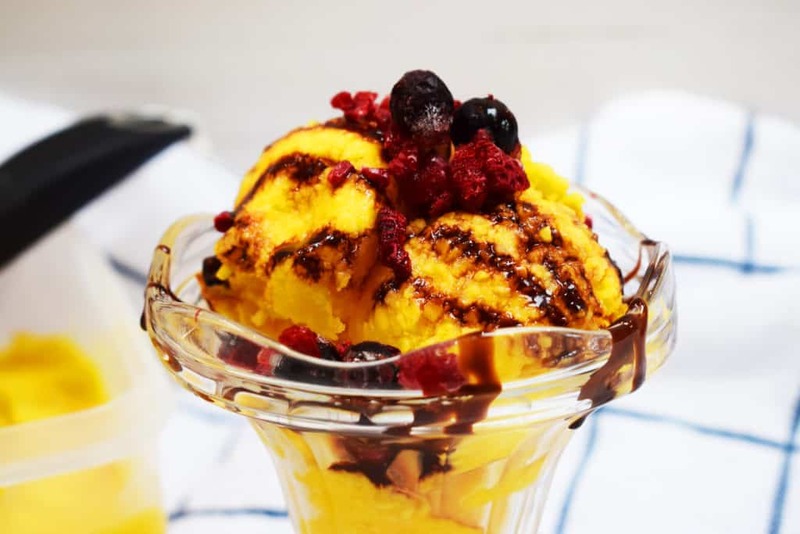 Picking sorbet over ice cream as a dessert option is a great idea if you’re trying to live a healthy lifestyle. It’s low sugar, low fat and a much lighter end to your meal! It’s these kinds of healthy swaps that can make all the difference, no matter which diet or plan you’re following, because it’s essential to find the areas where you can improve. Making it yourself means you have full control over how much sugar goes into your sorbet too! 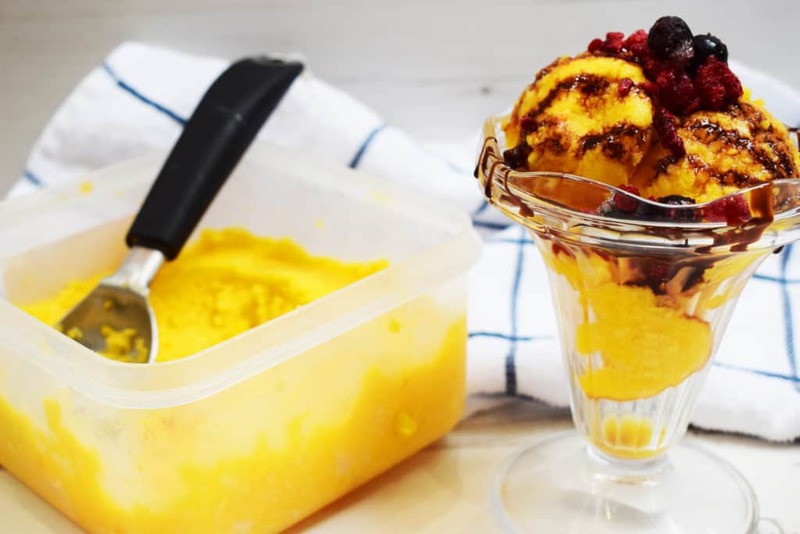 This homemade mango sorbet isn’t packed with sweetener or sugar, which makes it all the healthier. Using the natural sweetness of the mango, enhanced slightly with just a tablespoon of honey. 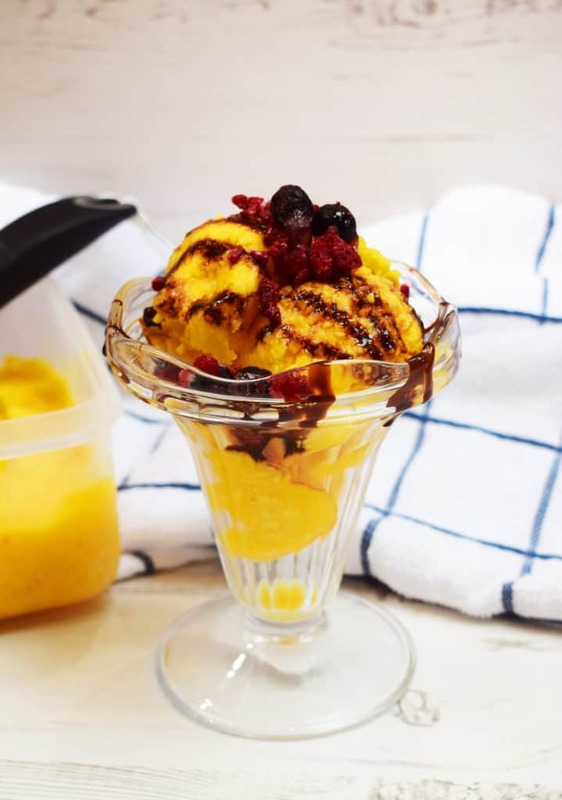 It just goes to show that you don’t need tonnes of sugar to help with your sweet cravings, and that having a tub of this healthy homemade mango sorbet in the freezer could be the best thing for your diet! 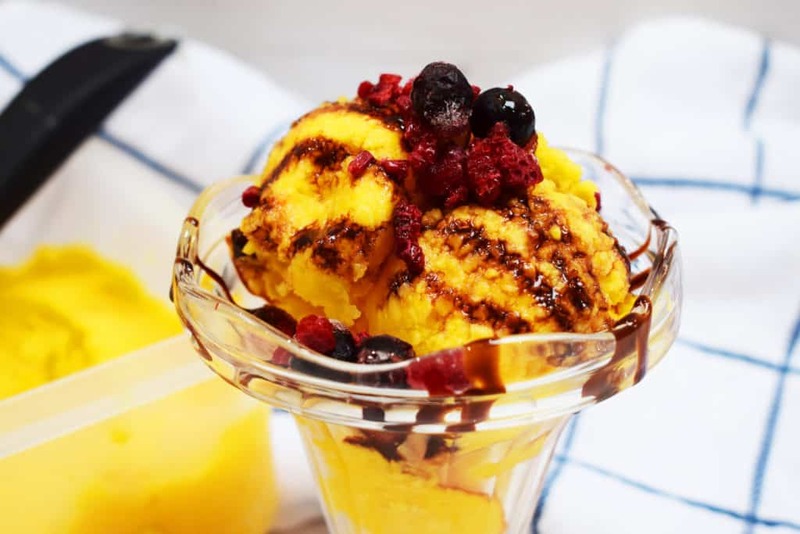 Smooth and delicious homemade mango sorbet, 3.5 syns on Slimming World. Blend the frozen mango pieces and honey in the food processor. Add the water and blend again until smooth. Tip out into a Tupperware and smooth it down evenly. Freeze for 10-15 minutes, or until you want to eat it, and serve with your choice of toppings. 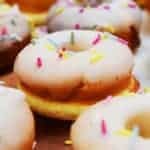 3.5 syns on Slimming World per 100g. Syns correct at time of writing. 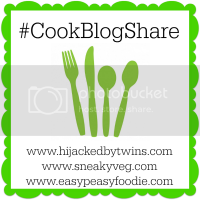 Please do not share screenshots of this recipe, share the link instead! 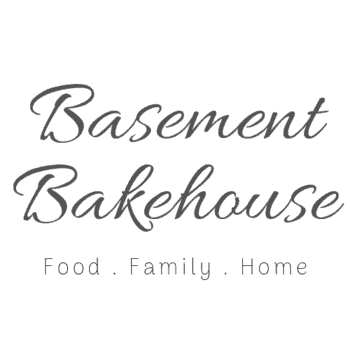 It helps protect against people stealing the recipes for other websites. 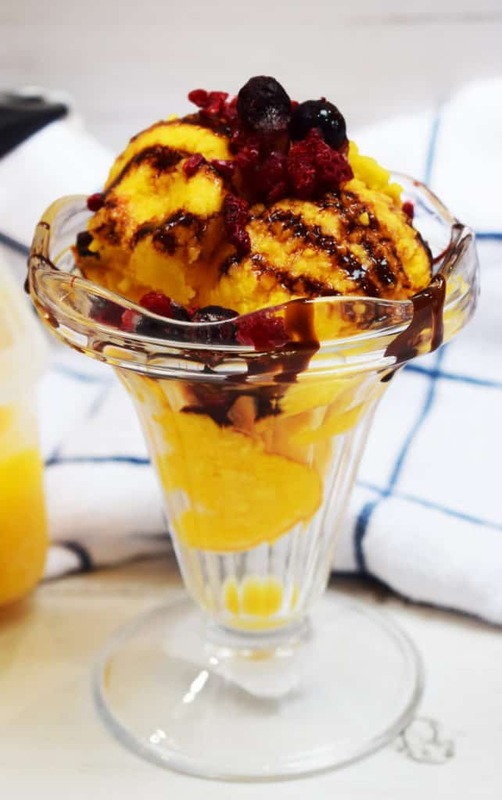 DON’T FORGET TO PIN THIS EASY PEASY 20 MINUTE HOMEMADE MANGO SORBET RECIPE FOR LATER! Mango sorbet I love it. Yours looks so pretty too. Mango is my favorite fruit! I'll be making this for sure! 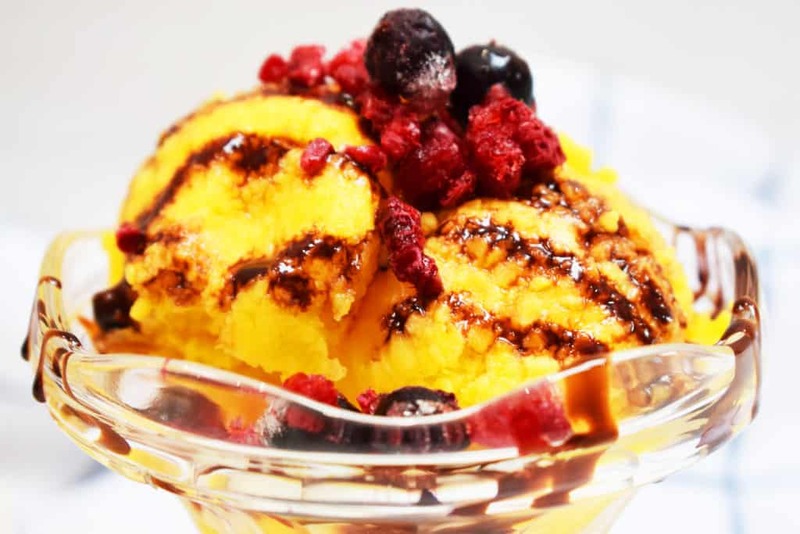 I just love fruit sorbets and it will be mango season here before you know it. I'm definitely going to try this when the fruit is ready! 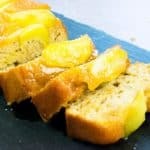 Nice recipe with one of my favorite fruits. The fact that it's very healthy is a big plus, also! Wow! 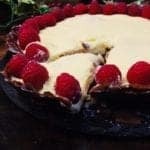 This looks absolutely gorgeous - and so quick and easy too! I shall definitely be making it this week. One thing, Cliona. Could the honey be replaced with granular low cal sweetener? That would knock out the Syns completely then I would think. Keep the recipes coming, you're doing a grand job! HI Janine, thanks so much, I'm really glad you like the recipe! Yes you could absolutely replace it with sweetener if you wanted to. Just to let you know, under Slimming World's latest rules you need to syn granulated sweetener at half a syn per tablespoon. If there's less than a tablespoon per portion though you don't need to syn it. Just love the colour of this! I must try, never knew making sorbet was so easy!